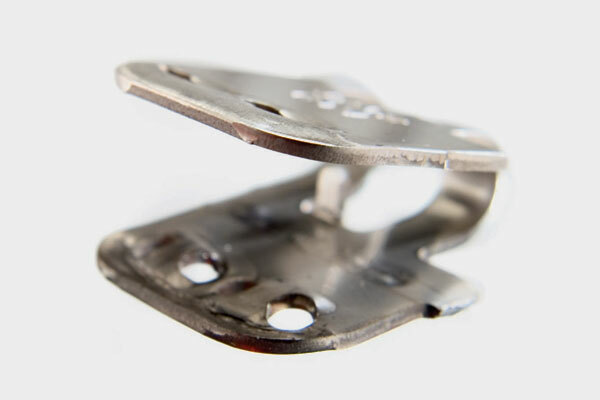 Staplegrip belt fasteners are unique, compared to conventional lightweight belt fasteners, because the staples are clinched 90° to the direction of the pull of the belt. Therefore, it is virtually impossible for the staple to open under load. Our staples are also unique. While other brands are rectangular, with their narrow dimension in line with the pull of the belt, Staplegrip staples are oval-shaped with smooth, rounded edges. This design feature reduces the possibility of the staple damaging the belting fabric. Staplegrip is selected based on the thickness of the belt and the diameter of the drive pulley. Specify the belt width when ordering. Click on the Product Line tab above once you have selected your size specification. Traditional Staplegrip Lacing comes in the popular 62, 125, and 187 sizes, which fit belts 1/16″ – 1/4″. The lacing is cross-scored so it can be easily broken by hand to exactly fit any belt width. Each box includes 4 sets of lacing with sufficient hinge pins, staples, and installation instructions. *10 Sets/Box. All others 4 Sets/Box. Note: Comb for 6" section.